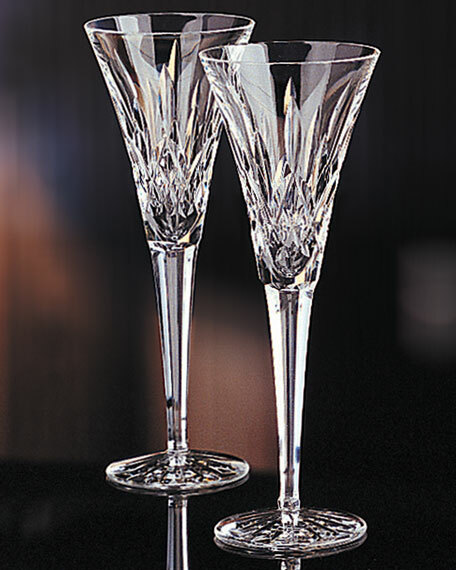 Lead crystal of timeless diamond and wedge-cut bowls. Set of two; each, 3.5"Dia. x 9.5"T.
Mouth blown glass stemless flute with pepita etching. Each glass is handmade; size and color will vary slightly. Approx. 3"Dia. Mouth blown glass stemless flute with pepita etching. Each glass is handmade; size and color will vary slightly. Approx. 3"Dia. x 8"T. Hand wash. Imported. Mouth-blown glass extremely tall opalescent champagne flute. Engraved, "pepita" pattern etching. 3"Dia. x 12"T. Hand wash. Imported.